is of critical importance and so is the hand on which this type of Headline is found. Brilliance is brilliance only if it exists within the right personality framework and is used to achieve something positive. Brilliance is genius when it is of the cerebral variety and does not restrict itself to a skill, either mental or physical. 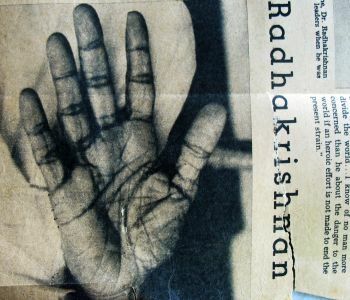 Besides the Headline, the significant features of Dr Radhakrishnan’s hand are his dark, well-etched lines on a large palm, well-shaped fingers with well-balanced finger phalanges, big thumb, strong mounts of Jupiter, Mercury, Moon and the mounts of Upper and Lower Mars. All these signs show personality traits which provide a fertile ground for high intelligence to flourish, and also used in a productive manner. For one thing, the thumb shows extraordinary will, and the strong heartline, position of the headline and the shape of the fingers show an ethical and humane mindset which will enable the owner to use his abilities for productive work and the betterment of humankind. Moon adds to the imaginative disposition shown by the headline but the strong Mars is equally important as it shows not just persistence in the face of obstacles, but also tremendous mental strength and resistance, a quality absolutely essential with such a strong combination of Moon and the long sloping Headline. Without the Mars qualities and without the strong thumb, the headline and Moon combination can be a danger to the balance of the personality. The fork on the Headline is another critical feature of his hand as it lifts the headline from its purely imaginary position to the real world. If it wasn’t for this sign it is unlikely that Dr Radhakrishnan would have had the qualities of a President, although he might still have had the brilliance of an author. His hand also has good Sun and Saturn Lines which show the success he achieved. The Sun or Apollo line is remarkable. It starts deep and strong from the Lifeline itself, a sign of success which is the result of one’s own tremendous effort (Dr Radhakrishnan was born in a poor family and managed to study entirely on academic scholarships and borrowed books). This sign is rarely found and usually shows up on a hand which reveals not just talent and intelligence but also the positive personality traits mentioned above. Cheiro had such a sign. The Saturn line goes upwards towards the Mount of Jupiter showing that the person is likely to reach an authoritative position in his later years. *Dr Sarvepalli Radhakrishnan (1888 -1975) was a was an Indian philosopher, statesman and author. He was the first Vice-President of India (1952–1962) and then later the second President of India. You might also like to read Dr A.P.J. Kalam’s hand reading, Pranab Mukherjee's hand reading or Rajiv Gandhi's or Barack Obama's. Check out all the hand readings of Heads of States from different parts of the world, or Spiritual Leaders of the world and from India. 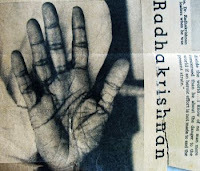 Very interesting to read about Dr. Radhakrishnan. He is one of the historical figures I admire the most. Thanks. This man's interpretation of our national flag is one of the best I have read. truely a remarkable person. And his hand shows this up. So the sun compensates for the fate? Anil, that's an interesting question because often it does. However Dr. R's hand has a very strong fate line as well, and even his sun line is an offshoot of his fate line. The strong fate line is in keeping with the temperament of Dr.R, as it shows well developed saturnian qualities like wisdom and seriousness. DI, That was the thought going through my mind when I was looking at his hand. How the quality has gone down. I was looking at Pratibha Patil's hand and it is so bad that I did not feel like reading it! Maybe I will though, one of these days. When it comes to Kalam, yes, he is on the list. About my father, palmistry has been a hobby with him. He has been studying palmistry for a long time, since he was in college. He never took it up professionally but he is well known in our own social circles for his amazing talent. My interest in palmistry started because of him and I have also learnt quite a bit from him and the records he has kept over the years.